She is stunning. And fast and most of all, comfortable. I cannot believe how comfortable she is. She is the kind of comfortable that makes her feel like an extension of me while I am riding her, rather than feeling like I am fighting against her. I’ve thought about getting a road bike for about 2 yrs now, but this year I’ve actually been quite committed to cycling and it was a better time than any other. And I was convinced that this would make me fall. Honestly, I managed to get all clipped in without even knowing it. At some point, before I wanted to, it happened. And it really wasn’t a big deal. The thing about clipless pedals is instead of feeling like you are pedaling seperate from the bike, it sorta feels like you are one with the bike. Amazing. I didn’t fall. Not even close. I know it will probably happen at some point, but it didn’t happen today. Sunday I’ll be taking a much longer and hillier ride. I am not sure exactly how long it will be, but I am eager to give a road cyclist ride a try! Wow, it has been a full week since I got a ride in. Funny how getting back into a routine with Bug causes my own routines to languish. We had a taco ride planned on Thursday, but we had very severe storms and had to stay home. Turned out that was the best idea ever, as the trail and the town we stop in were hit the hardest from those storms. Tons of damage pictures coming out of that area. Today was the corporate cycling challenge, and I had signed up for the 42 mile route. I was assuming I’d be basically doing this on my own, but my friend Grant, an up and coming new cyclist in our group, did decide he could give the 42 miler a shot. He wasn’t convinced he could do 42 miles or hills, but I was convinced he could. We set out early this morning. First big hill gave Grant a run for his money, but by the halfway point he had become one with his shifting and was able to toast me on some of those hills from then on out. It is nice to have yet another cycling partner who seems to enjoy some hilly riding. I can use all the company I can get! We did the entire ride, with stops, within 4 hours which is an excellent first long ride! When I got home, I was a little bit jello like, so I sat on the couch and knit on some socks I’ve been working on for over 2 months now. They are for Nick, and he’s been eager to receive them as he has seen the in progress pictures and loves the color. These are malabrigo sock yarn socks, done in my own pattern, toe up, with afterthought heel. Feels great to have them done. I still need to work on my commission knit, but I am at a stopping point on the sleeve as it seems too wide. I’ll check with the recipient tomorrow and then take it from there. Hopefully I can get a better picture of these once Nick receives them! Boy, I could really go for a burger about now! Of course Bug would be a major player in my new endeavor! This is Bug with her tug a bug. Notice her awesome bike shorts and jersey, her jersey is decorated most appropriately. With lady bugs. Sarah, Grant, Bug, and I set out for a ride yesterday evening. We had it in mind to do about 12 miles. This was farther than Bug had ever pedaled before. Prior to this, she had pedaled 8 miles with my mom. At about 7 miles, we stopped for dinner. Bug pedals for ice cream! In the end, we completed 15 miles of biking, this is Bug feeling triumphant. She did a great job, and didn’t complain about speed or about being sore. Sarah watched her carefully, she was a good help for about 10 of those 15 miles, and then I had to do all the rest of the work. I knew that towing the bug would probably continue to help me build muscle during this training process, but I had no idea just how much. Today is the first day this year that I have been sore after a ride. Even after the first day of Ragbrai, my legs were sore but not tired. Now, my legs and arms hurt. It takes concentration and endurance just to keep us both upright and adjust to the constantly moving bike. Then there is the power needed to pedal an additional 60 pounds, sometimes without help. Training with Bug is going to be serious business! Thankfully it seems that it will be serious business that Bug will enjoy. Hoping to get her out on the bike again on Tuesday. I know there hasn’t been much lately, but I have been working on a few things in a limited manner. The other night, instead of riding, Sarah decided it would be a night to have pizza and watch a show. And I obliged. 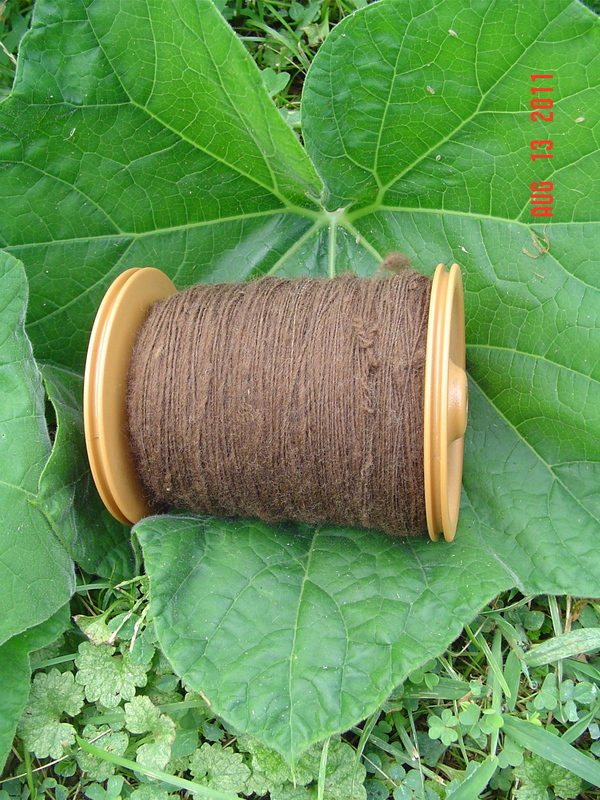 While there, I did a little spinning on the Sepia fleece. I now have one full bobbin! While at work, I’ve been working on the Rick socks from Sock Innovation. 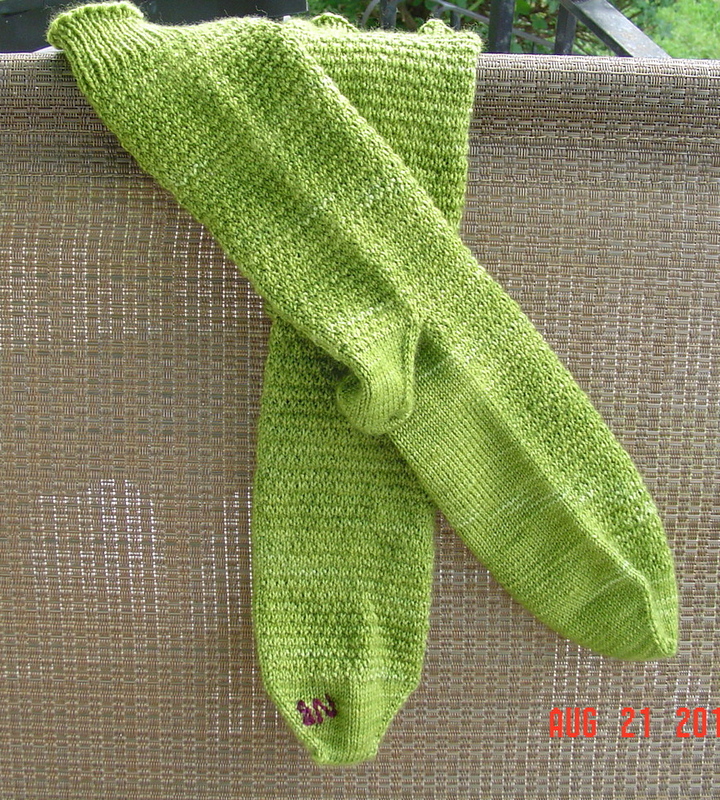 These are truly beautiful socks and I am loving knitting them. Excellent pattern! I’ve cast on the second sock and will continue working on it at work. Then, in commission knitting news, I’ve been commissioned to knit a plain, natural color sweater. It may be boring work and slow going, but the results look awfully nice! Tonight is a bike ride night. Tomorrow is a bike ride day. I doubt there will be much to show you in the crafting department for quite a while! Last Sunday, during a lovely 28 mile ride on the Wabash Trace to Silver City, Mary, Stella, and I decided to plan a 44 mile ride the next week. We decided to go all the way to Malvern on the Trace. Stella had said there were some fun things to see, and I was eager to see them. Saturday night we had some major storms roll through, but Sunday dawned cool and beautiful and we started our ride at 7a.m. Mary and I got on the trail, but to our surprise, there were trees to portage! The storm had knocked 7 trees right over the trail, so there was a lot of stopping and starting in those initial miles. A lot of our ride was cooperation that looked like below. Stella and Mary lifting Mary’s bike over a dead tree. The ride was wonderful even so. The day couldn’t have been more beautiful, the company fantastic, and 44 miles while long, felt really really good. We saw all manner of fun things. Deer, a baby coyote laying on the trail, lots of other cyclists and runners, and I have one picture I am saving for another day. We had lunch at a sub and ice cream shop in Silver City. We met a lovely older gentleman there and we talked to him during our time there. We also have ice cream sundaes. Well deserved on such a lengthy ride! Today’s ladies ride was the long version. So worth it for the view of the Missouri River we got! Lots of hills which I love, and lots of lovely women riding. After I got home I was able to get the lawn trimmed before the second planned ride. Then I met up with OrangeKathy in order to do a little more road bike test riding. I tried out some women specific frames as well as some men’s frames. Since I am tall, I thought this would be a wise thing to do. The reach is far too long for me to be riding a men’s bike, so I took a women’s specific bike out for a longer ride. It was a bit….disappointing. There were issues with the size of the handlebars and this created pain in my neck, back, shoulders, wrists, hands, even down into my knuckles. Yep, it was fast. But that doesn’t mean I liked it! Tomorrow we have a 7 a.m. 44 mile ride on the Wabash Trace planned. Last week we made it down to Silver City. This week we fly on by to Malvern. I am really really looking forward to hanging out with the girls and getting my miles in. As I have mentioned, I have not been knitting much at all. In fact, I do believe the projects I am about to show you were completed last weekend, I just didn’t have time to photograph them once they were done. And no, I have no finished objects for you. 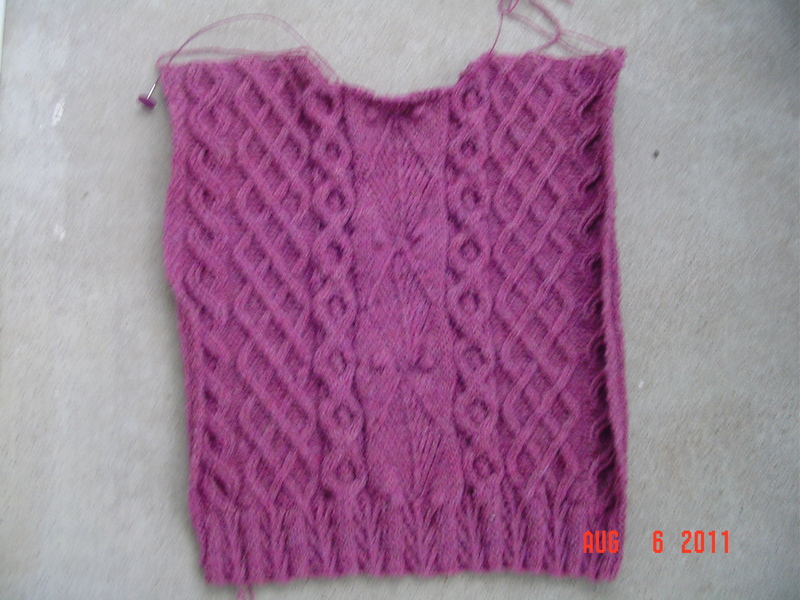 The first is the front of my Starmore sweater in progress. The yarn is blackwater abbey which I picked up at stitches midwest on my first trip there. Long ago now. Maybe 2009? This has been on the needles since November last year, so it is fantastic to see any little progress on it. The front is done, but I have not cast on the back. 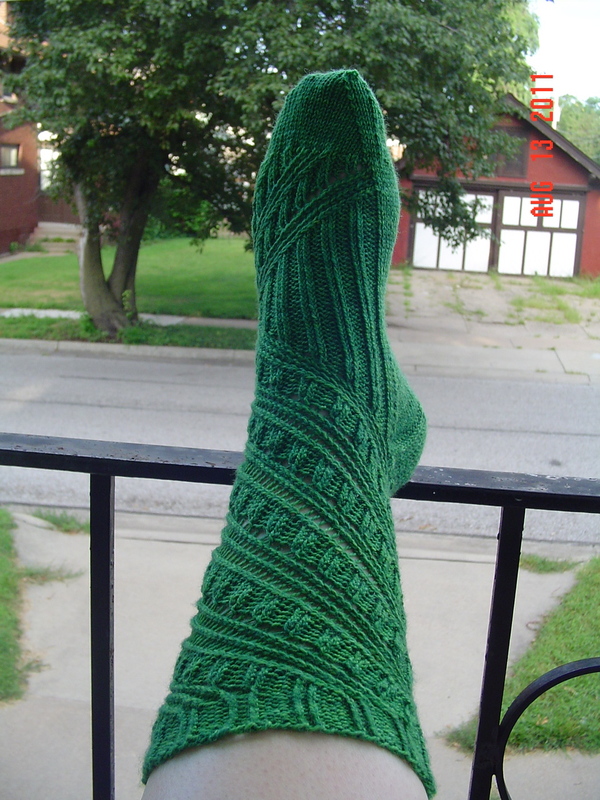 The second project is Tsock Tsarina’s oddly constructed Fronkenshteek sock. I started it last weekend because I knew it would bug me until I gave it a try. 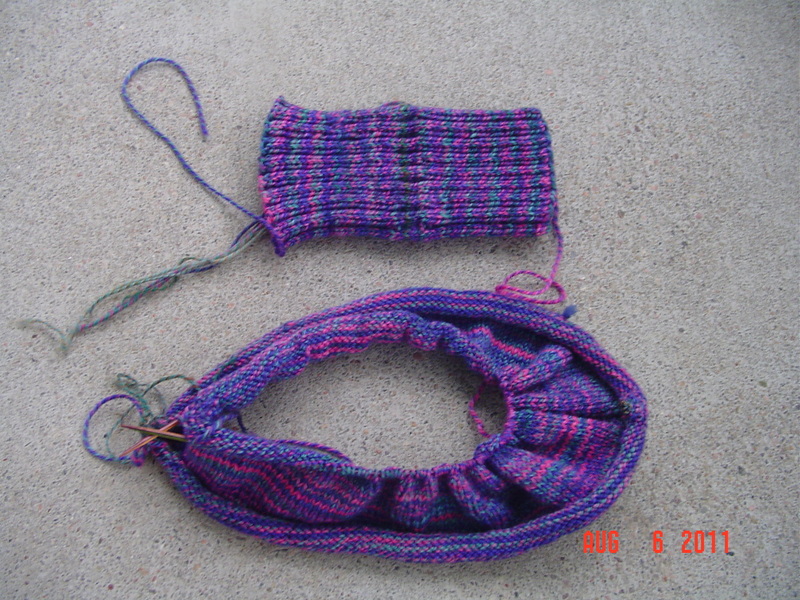 The parts I have completed are the cuffs, and the upper intertubez. Yarn is Rio de la Plata sock yarn. I was hoping for longer color stripes like handspun, but I didn’t get that, and had no interest in ripping and balling up my handspun, so there you have it.